Nefertiti (ca. 1370 BC - ca. 1330 BC) was the Great Royal Wife (chief consort) of the Egyptian Pharaoh Akhenaten. Their story is best read on his file. 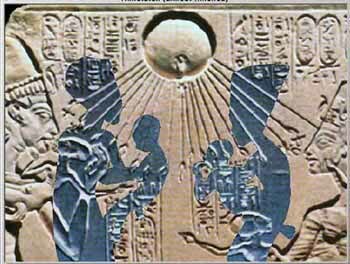 Nefertiti and her husband were known for a religious revolution, in which they worshiped one god only, Aten, or the sun disc. The exact dates of when Nefertiti was married to Akhenaten and later promoted to his Queen are uncertain. However, the couple had six known daughters. Her name roughly translates to "the beautiful one is come". She also shares her name with a type of elongated gold bead that she was often portrayed as wearing, known as "nefer" beads. Famed throughout the ancient world for her outstanding beauty, Nefertiti remains the one of the most well known Queen of Egypt. Though Akhenaten had several wives, Queen Nefertiti was his chief wife. 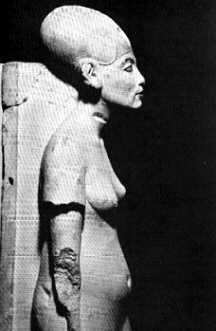 She was made famous by her painted limestone bust (above), now in Berlin's Egyptian Museum, shown to the right. The bust, seen from two different angles, is indeed, the most famous depiction of Queen Nefertiti. Found in the workshop of the famed sculptor Thutmose, the bust is believed to be a sculptor's model. The technique which begins with a carved piece of limestone, requires the stone core to be first plastered and then richly painted. Flesh tones on the face give the bust life. Nefertiti's origins are confusing. It has been suggested to me that Tiye was also her mother. Another suggestion is that Nefertiti was Akhenaten's cousin. Her wet nurse was the wife of the vizier Ay, who could have been Tiy's brother. Ay sometimes called himself "the God's father," suggesting that he might have been Akhenaten's father-in-law. However Ay never specifically refers to himself as the father of Nefertiti, although there are references that Nefertiti's sister, Mutnojme, is featured prominently in the decorations of the tomb of Ay. We may never know the truth of this bloodline. Nefertiti first appears in scenes in Thebes. In the damaged tomb (TT188) of the royal butler Parennefer the new king Amenhotep IV is accompanied by a royal woman, and this lady is thought to be an early depiction of Nefertiti. The king and queen are shown worshiping the Aten. In the tomb of the vizier Ramose Nefertiti is shown standing behind Amenhotep IV in the Window of Appearance during the reward ceremony for the vizier. During the early years in Thebes Akhenaten (still known as Amenhotep IV) had several temples erected at Karnak. One of the structures, the Mansion of the Benben (hwt-ben-ben), was dedicated to Nefertiti. She is depicted with her daughter Meritaten and in some scenes the princess Meketaten participates in the scenes as well. In scenes found on the talatat Nefertiti appears almost twice as often as her husband. She is shown appearing behind her husband the Pharaoh in offering scenes in the role of the queen supporting her husband, but she is also depicted in scenes that would have normally been the prerogative of the king. She is shown smiting the enemy, and captive enemies decorate her throne. In the fourth year of his reign Amenhotep IV decided to move the capital to Akhetaten (modern Amarna). In his fifth year, Amenhotep IV officially changed his name to Akhenaten, and Nefertiti was henceforth known as Neferneferuaten-Nefertiti. The name change was a sign of the ever-increasing importance of the cult of the Aten. It changed Egypt's religion from a polytheistic religion to a religion which may have been better described as a monolatry (the depiction of a single god as an object for worship) or henotheism (one god, who is not the only god). The boundary stelae of years 4 and 5 mark the boundaries of the new city and suggest that the move to the new city of Akhetaten occurred around that time. The new city contained several large open-air temples dedicated to the Aten. Nefertiti and her family would have resided in the Great Royal Palace in the center of the city and possibly at the Northern Palace as well. Nefertiti and the rest of the royal family feature prominently in the scenes at the palaces and in the tombs of the nobles. Nefertiti's steward during this time was an official named Meryre II. He would have been in charge of running her household. Inscriptions in the tombs of Huya and Meryre II dated to Year 12, 2nd month of Peret, Day 8 show a large foreign tribute. The people of Kharu (the north) and Kush (the south) are shown bringing gifts of gold and precious items to Akhenaten and Nefertiti. In the tomb of Meryre II, Nefertiti's steward, the royal couple is shown seated in a kiosk with their six daughters in attendance. This tribute from year 12 is one of the last times princess Meketaten is shown alive. Meketaten may have died in year 13 or 14. Nefertiti, Akhenaten, and three princesses are shown mourning Meketaten. Nefertiti disappears from the scene soon after that. About Year 14 of Akhenaten's reign, Nefertiti vanishes from the historical record. There is no word of her after that date. Theories include sudden death by a plague that was sweeping through the city or another natural death. This theory is based on the discovery of several shabti fragments inscribed for Nefertiti (now located in the Louvre and Brooklyn Museums). A previous theory that she fell into disgrace is now discredited, since the deliberate erasures of monuments belonging to a queen of Akhenaten have been shown to refer to Kiya instead. During Akhenaten's reign (and perhaps after), Nefertiti enjoyed unprecedented power. The Coregency Stela may show her as a co-regent with her husband. By the twelfth year of his reign, there is evidence that she may have been elevated to the status of co-regent: equal in status to the pharaoh. It is possible that Nefertiti is to be identified as the ruler named Neferneferuaten. 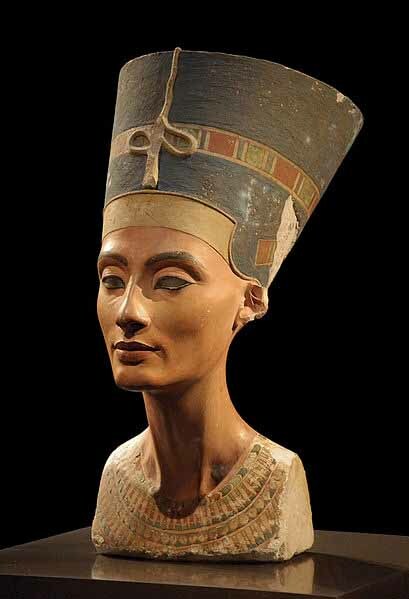 Some theories state that Nefertiti was still alive and held influence on the younger royals. If this is the case, that influence and presumably Nefertiti's own life would have ended by year 3 of Tutankhaten's reign (1331 BC). In that year, Tutankhaten changed his name to Tutankhamun. This was evidence of his return to the official worship of Amun, and his abandonment of Amarna to return the capital to Thebes. There are many theories regarding her death and burial but to date, the mummy of this famous and iconic queen has not been found or identified. Two mummies have been found which were initially believed to be her remains but has since been ruled out following recent DNA testing in 2010. Neferneferuaten-Nefertiti, May she live for Ever and Always. Together Akhenaten and Nefertiti transformed the religious practices of ancient Egyptian society. This limestone relief (above), found in the Royal Tomb at Amarna depicts Akhenaten, Nefertiti, and two of their six daughters making an offering to the sun-disk Aten. Akhenaten and Nefertiti carry flowers to be laid on the table beneath the "life-giving" rays of the Aten. The figures are carved in the grotesque style, a characteristic of the early half of the Amarna period. Nefertiti, sporting the double plume headdress mentioned in the stela dedication, is the petite figure placed behind her larger scale husband. The compostion mirrors early artistic representations of the royal couple. To emphasize the strength and power of the pharaoh, Egyptian iconographical tradition required the female figure to be smaller in scale than the male. It is possible that Akhenaten's successors Smenkhkare and Tutankhaten were his children by another royal wife called Kiya who became his principle queen for a short while after year 12 of his reign. As with Akhenaten there is no trace of Nefertiti's mummy. Some jewelry bearing her cartouche was found outside the royal tomb at Akhetaten but there is no real evidence that she was buried there. From surviving record it seems she either fell from favor or died at around year 12 of Akhenaten's reign. In this case her burial may have been elsewhere. It is interesting to consider that the busts on this page were found in a sculptors workshop at Akhetaten. It seems that when the city was abandoned they were left behind because such was the anti Atenist feelings that no one wanted them. It is suspected that they were murdered, but the priests of the day who wished to return to the old religion - the worship of a panteon off gods and goddesses - stone idols - things one could see physically. 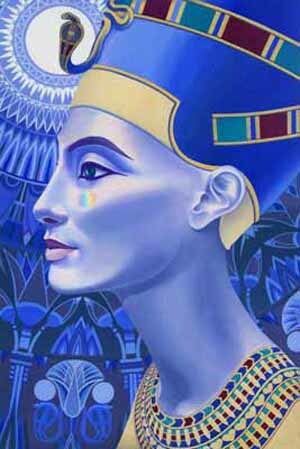 Nefertiti's place as an icon in popular culture is secure: she has become a celebrity, the second most famous "Queen" of Egypt in the European imagination and influenced through photographs the changed standards of feminine beauty of the 20th century. The sandstone relief above found in a temple at Karnak depicts Nefertiti praying to Aten and is characteristic of the Karnak style. It shows grotesque features include an oversized ear, a protruding face, an elongated neck and chin. This does remind one of realistic images of Akhenaten, who many suspect suffered from an illness called Marfan Syndrome, characterized by unusually long limbs. The mummy that was examined by the team was discovered damaged in a way that suggested the body had been desecrated either at the time of death or shortly after. Mummification techniques, such as the use of embalming fluid and the presence of an intact brain suggest an eighteenth dynasty royal mummy. Among the most suggestive features are the age of the body, the presence of embedded nefer beads, the fact that the arm had been buried in the position reserved for pharaohs and had been snapped off by vandals and replaced with another arm in a normal position, and a wig of a rare style worn by Nefertiti. On June 12, 2003, Zahi Hawass, head of Egypt's Supreme Council for Antiquities, dismissed the claim, citing insufficient evidence. 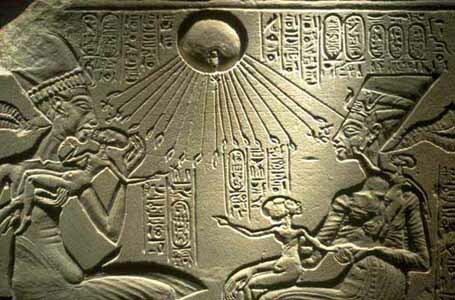 According to Ancient Alien Theory ... Nefertiti and Akhenaten were not of this world ... coming here to help humans understand that there is only one god ... light and consciousness ... and the worship of stone idols is false. Was that really the sun they were praying to or something else? 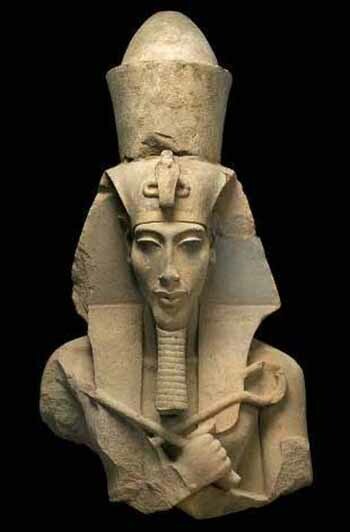 Three thousand years ago, the rebel Pharaoh Akhenaten preached monotheism and enraged the Nile Valley. Less than 100 years after Akhenaten's death, Moses would be preaching monotheism on the bank of the Nile River, to the Israelis. The idea of a single God, once the radical belief of an isolated heretic, is now embraced by Moslems, Christians, and Jews throughout the world. 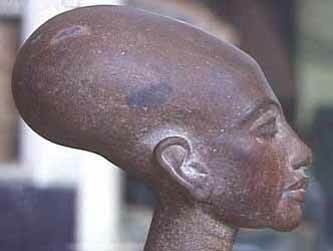 The vision of Akhenaten lives on!